A SPOOKY TALE, A SOGGY PODCAST!! Have you heard the legend of the PS3 Slim? Some say it may be more than a legend... but lest you fall victim to Sony's clutches, you best not blog of it! Is the PS3 Slim real? Watch our new video, "The Tale of the PS3 Slim," on IGN right now! You can also probably see why we almost called the video "Hey, We Bought A New Dolly." 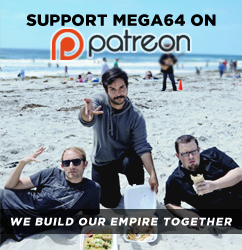 Once you're done with that feast of frights, why not cool off by the poolside with the Mega64 Podcast Episode 109? We discuss Wii Sports Resort, Fat Princess, Turtles in Time, and of course, BBQ food slang. Watch below or subscribe to the left! Audio version here. We'll be back soon with more fun stuff. We might even come back sooner if you buy our new shirt or poster! But, you know, who knows.